AI collaboration was a hot topic at 2019’s Futurescope (#FS19) and Blueface co-founder, Feargal Brady joined the discussion on the Collaboration Stage. Feargal was joined on stage by AI and robotics experts including Conor McGinn (TCD, Robotics and Innovation) and Andrew Jenkinson (Director and Cofounder, VStream Group) and Siobhan Clarke (TCD) to discuss AI x Human coworking. Moderated by Prof. Barry O’Sullivan, the panel explored what true collaboration with machines can bring and addressed deep philosophical AI questions. The panellists shared similar levels of optimism and concern but also highlighted the stage of development that AI was really at. AI, unlike the promise of cold fusion, is here now in some respect and is dramatically changing the way we work and the future jobs landscape. It’s not just how we work that’s changing, where we work is also transforming. 5G can unlock true freedom to work anywhere. It should come as no surprise that a UCaaS company, driven by the future of enterprise mobility, would be all ears for Smart Cities and DenseAir’s 5G discussion on the Innovation Stage. 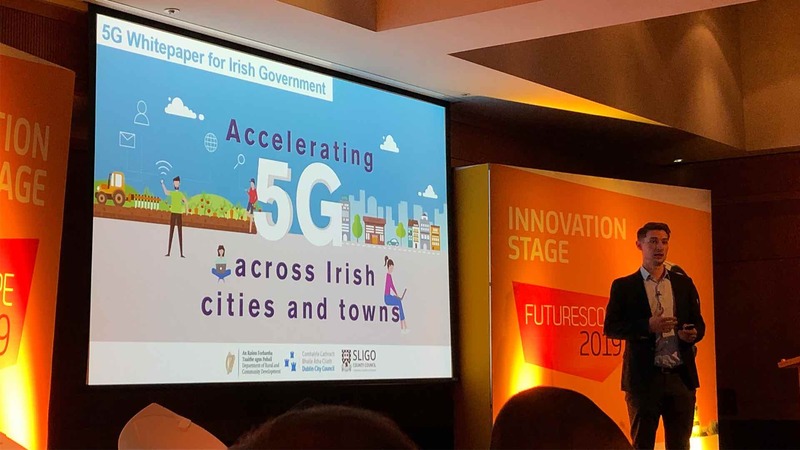 Pockets of Dublin City Centre are hosting early-stage trials of 5G with small cells dotted around the Docklands testing grounds. Global telcos aim for a full-scale PSTN Shut Down / IP Migration by 2025 and to accomplish this, a viable alternative – VoIP and UCaaS – needs to be available for all affected customers. Blueface believes that 5G could be a connectivity solution to underserved-by-fibre areas, expediting VoIP proliferation. Blueface customer, Dogpatch Labs joined the 5G panel as early trial adopters. The leading startup hub cultivates innovation by encouraging incumbent businesses to trial their new tech in the IFSC’s technologically advanced CHQ Building. This culture of technological experimentation in the IFSC is a key driver for digital transformation in Ireland and across the big blue marble. As a global UCaaS provider, Blueface is excited for the future of connectivity and infrastructural enhancements. Futurescope 2019 wrapped up with networking over drinks from #FS19 Sponsor and Blueface customer, Teelings Whiskey Co. It was a pleasure to share ideas and perspectives with some of the leading thinkers in Ireland’s technology industry. Plans are already in motion for #FS20, so don’t miss out. Visit Futurescope’s website to see more highlights of FS19 and plan your visit for next year. See you there!